Hunnam recently confessed he and Robert did not get along. 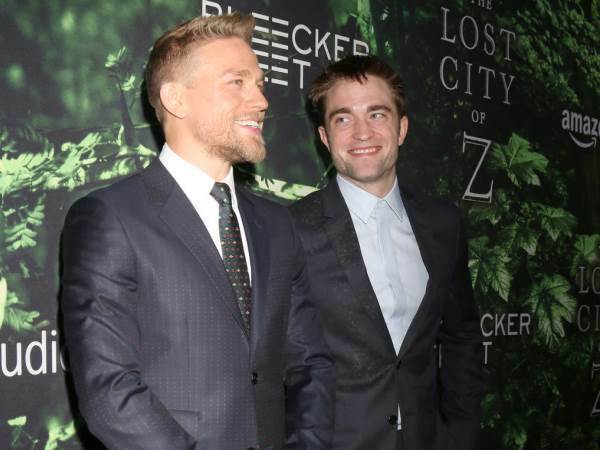 Charlie Hunnam has backtracked on remarks he made about working with his The Lost City of Z co-star Robert Pattinson, insisting the two Brits weren't on set to be friends. "I don't think I said more than 10 words to Robert off camera," he told ScreenDaily.com last month. "I didn't know if he was just in that zone or if he genuinely didn't like me. There was a real distance between us." Charlie has since explained the Twilight star reached out to him when filming wrapped, "making overtures for us to be friends now", and as the two stars promote the film together at premieres and parties, Hunnam insists he now understands why Pattinson chose to keep his distance. "There was something really exciting about the idea of not knowing someone, just letting a relationship exist exclusively on the screen," the 36-year-old tells Entertainment Tonight. "I had decided that I wanted to do that, but sometimes that can be alienating, and (can) put another actor off of their work and I don't want to be that selfish. "I started playing this game with Rob and he just started playing it right back. I think we both really understood what we were doing and there was no real contention or beef between us - we were just playing the game." Charlie admits he has really got to know Robert now the film has wrapped and thinks he's "a lovely guy", adding, "I can actually enjoy having a drink with him now and a hang." In The Lost City of Z, which hits U.S. cinemas on 14 April, Hunnam plays explorer Percy Fawcett, who disappeared in 1925 while on a search for a mythical city in South America. Pattinson portrays fellow explorer Henry Costing.